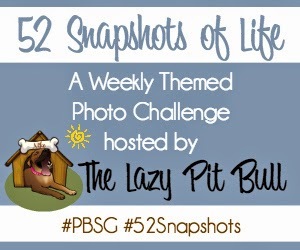 I’m excited cos this is a new year and I’m participating in a brand new photo hunt called 52 Snapshots of Life! This one is hosted by The Lazy Pit Bull and the themes—or challenges as I like to call them—might not be as stupid trying as the one at the WhistleStop Cafe. In fact, they might come over to say hello! They have a real live linky tool too. That said I may at times go back and revisit the old PhotoHunt. I like being unpredictable. Click on the image below to see the other participants. This week’s challenge is NEW and I couldn’t decide which of my new toys to feature. 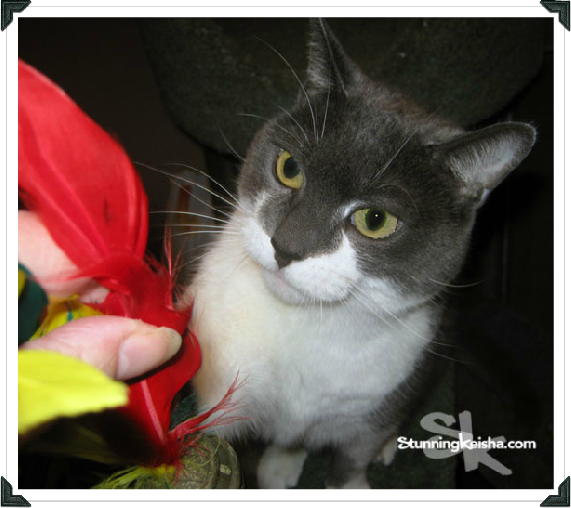 I finally settled on the same feather toy I featured from my Secret Paws package. TW got some good shots where I’m in focus—big surprise there. No surprise though that I bit her shortly after this pic was snapped. Guess you can say I’m a pit bull of a cat! 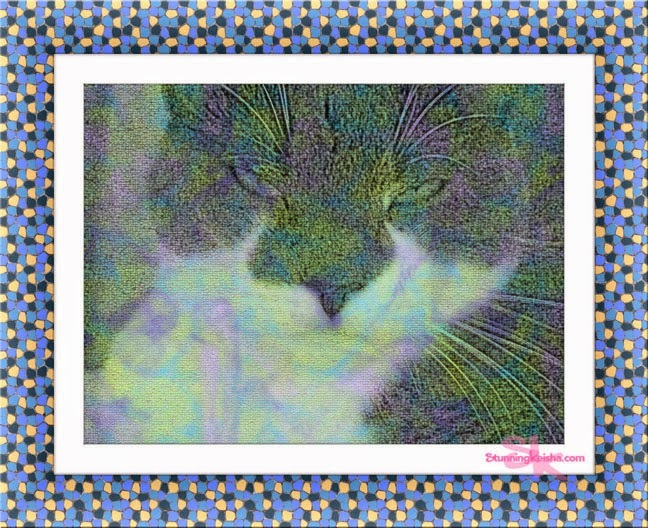 It’s Caturday and that means I’m also participating in Athena and Marie’s Caturday Art Blog Hop. Contrary to popular belief, it’s not just for cats. Anyone with (or without) a talent can participate. Click the link to see the other bloggers taking part. It’s a good time for all. I wanted to show my art smaller but like all good art, it lost that certain something. Below is the original out of focus foto. Back in 2010 I added some pebbly PhotoShop filter but for this blog hop I decided to get more ambitious and do more. I added some color noise and even though I’m personally against frames I did add a mosaic frame that sorta kinda matched. What do you think? 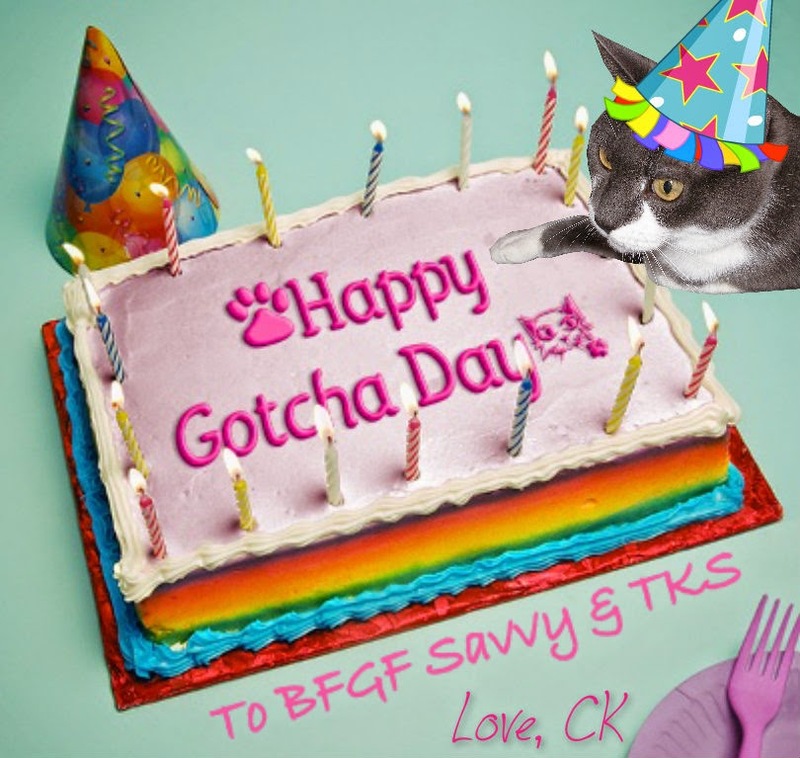 Gotta wish my BFGF Savannah Paw Tracks and her sidekick The Kid Sage both a Happy Gotcha Day. I sent them over a cake with layers of tuna and salmon to help them celebrate. We love the photo you started with too... lots of catitude! Great art today, CK! And yeah, new toys are always fun to feature! We love your photos CK!!!!!!! You are one stunning kitty! Meeeee-owwww! Excellent photos! We're going to check out the new Photo Hunt....we have a difficult time with some of the ones on the regular Photo Hunt. Nice snapshot! Should be a fun 52 weeks! Your work is just fabulous, just like you CK!!! Very artistic, CK. And thanks for the heads up about the new PhotoHunt challenge. Pawsum fotos CK. Weez fink da fwame looks ool. I thought you looked like you were concentrating on TW's fingers more than the new toy. Good job on the bitey. I bit my mum a good one tonight too when she gave me my pill. Great photos and art, but you BIT her?! This is going to be a fun photo challenge this year. Your artwork looks great with that mosaic frame! 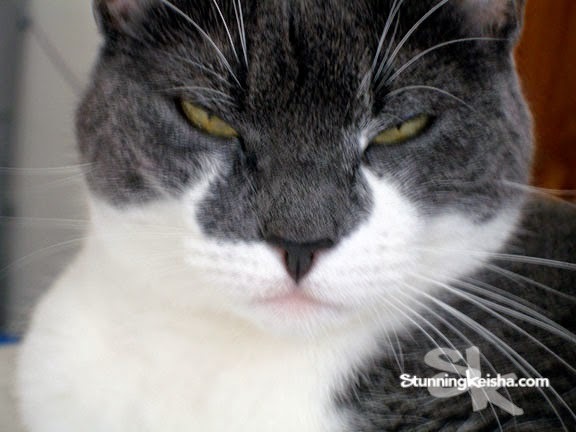 We're gonna hafta check out this photo challenge and try to pawticipate when we can. The art image is beautiful. Love the color noise effect and mosaic frame very much! You are very artistic in your first photo for the challenge! CK! Yous is Rock'n!!! Both the Photo Hunt and The Artsy Caturday and that Card for Savannah ... i uh, takes the cake!!!! Great art, we are doing both hops too. Awesome feather! Lucky girl. Leo said he'd gladly come over and play feathers with you, if you want? I think he blushed then..
You look a bit smug in that photo, CK. :) We like it with color noise. Very unusual. Happy New Year, my darling! We love ALL your pictures today! However, I must take issue with your assumptions about my sleeping through the New Year! I was up and about through most of the Human's New Year's Eve pawty, and by 12:30ish only about 4 people were left so I came and played my heart out with them--I played wand toys, and brushies and all kinds of stuff, and THEN I stayed up till about 4 a.m. with the Human while she finished straightening up and doing the dishes, so I *earned* my nappy on New Year's Day! A new theme ? that's interesting ! I hosted the Photo Hunt for more than a year, but there were less and less participants so I stopped ! Someone is very focused on that new toy!! That's a great shot, and I love the artsy photo too. Great job on both! Purrfect photo for the challenges CK. Shiner gots a new toy too. New toys are so much fun! Your new feather is beautiful.